If you are going to be in Argentina for a little while, then surely you’ll want to improve your Spanish, whether you’re a beginner, intermediate, or already advanced (in which case you’ll still want to get up to speed on the local Argentine dialect). Patricio, of Che Vos Spanish, is a good friend of BuenosTours and an excellent, experienced, and fun teacher who will help improve your castellano in no time! 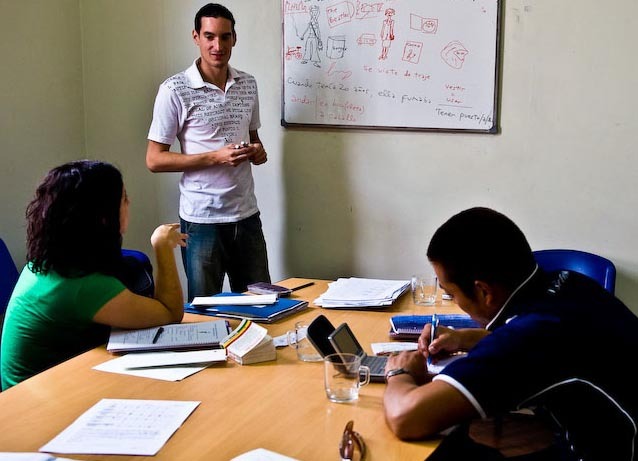 They are run by Patricio, a Spanish (and English) teacher from Buenos Aires, who has been teaching for 12 years in high schools, language schools and companies, which helped him develop his own dynamic approach to teaching Spanish. Patricio’s classes focus on communication but also include vital elements of Argentine culture, such as songs, movies, newspaper articles, history and politics, sports, local folklore and slang/street porteño Spanish. This makes it more fun to learn and also will give you indispensable local knowledge to help make your time in Buenos Aires happier and more interesting. The class schedule can be flexible and the lessons are adjusted to your needs, interests and learning pace. The course is very affordable and can be taken in the neighborhood (barrio) of Caballito (close to the Primera Junta stop on the A Line of the Buenos Aires subway), which is in the geographical center of the city, or any other place of your choice for a small extra fee. “I recently took private lessons with Che Vos Spanish after attending a well-know Spanish institute in Buenos Aires. The experience was great and in my opinion is a much better value than that offered by the language schools. The structure and quality of instruction is at least equal to that offered by the schools, but you can tailor the classes to your own interests. And you can also click here to see more testimonials for Patricio and his Spanish lessons, on his website. If you are staying for more than a couple of weeks, get into some local grooves with Maxi, a porteño who gives private classes in the international language of music. He has been studying and playing guitar music for 15 years, and knows his stuff. First there will be a general discussion of the student’s needs, expectations for the class, music they like to play and learn (whether it’s rock, folk, blues, electronic, or other types), etc. The course plan is designed specially for each student, and they can receive emails with exercises to practice at home. This keeps music in the students’ minds all the time… not just the time that they are in class. 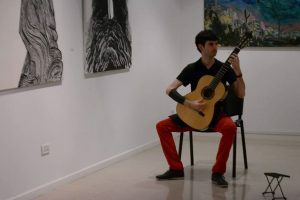 Maxi is in continual contact with his students – they can feel free to contact him if they have questions or want more exercises, which for example can relate to scales, chords and other music theory, open tunings, particular songs, and chords. Reading and writing music, ear training, pick and finger techniques can also be covered. But perhaps most importantly: all levels are welcome and catered for.